We stopped at the store yesteday to pick up ingredients for making Aperol Spritzes at home (awwww, a little reminder of Italy): Aperol (an Italian liqueur), Prosecco, San Pellegrino, and an orange. 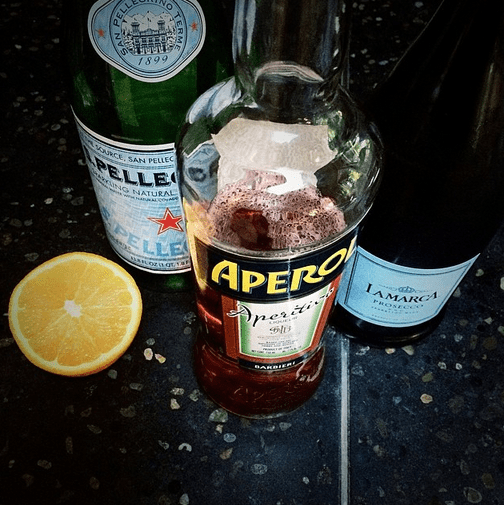 The Aperol Spritz is a refreshing summer cocktail (with a very fun bright orange color)! Last night I made us a little fresh bufala and heirhoom tomato salad, and some fresh figs with prosciutto and balsamic vinegar to to along with our spritzes. Yum!